Mainstream fact-checkers are still trying to discredit Bernie Sanders's Medicare-for-All plan. But there's no way around it: single-payer is entirely realistic. Two weeks ago, the libertarian Mercatus Center released a report estimating the cost of Bernie Sanders’s Medicare-for-All proposal. Like most think tank products, the author and communications team behind the Koch-funded Mercatus report carefully cultivated a certain kind of media coverage in pursuit of their political agenda. In this case, the political goal was to undermine Medicare for All by getting journalists to write that it was impossibly expensive. You can tell that this was their goal by looking at how the Mercatus paper was written, and specifically how its abstract was written. The first sentence contains the claim that many journalists put as their headline and lede: Medicare for All will “increase federal budget commitments by approximately $32.6 trillion” between 2022 and 2031. The rest of the abstract, and indeed the rest of the text of the paper, omits the more important fact that their estimate states that overall health expenditures would fall by $2 trillion over that period. The abstract then says “doubling all currently projected federal individual and corporate income tax collections would be insufficient to finance the added federal costs of the plan.” This claim makes it seem like the author is saying we would have to more than double federal taxes, but this is only because the author curiously excluded payroll taxes from the sentence, despite the fact that payroll taxes are the second-largest federal revenue source and the fact that payroll taxes are the main proposed mechanism for raising the funds. The abstract closes with the claim that “healthcare providers operating under Medicare for All will be reimbursed at rates more than 40 percent lower than those currently paid by private health insurance.” This is designed to trick journalists into thinking that Medicare for All would cut provider payments by 40 percent overall. Indeed, this phrasing did successfully trick the Washington Post ’s Glenn Kessler, who wrote as much in his piece and later had to issue a correction. The abstract fails to mention that, although provider payment rates for the privately insured will go down, provider payment rates for the uninsured and those on Medicaid will go up. This careful bit of framing and deception by Mercatus initially worked out as planned. They got the Associated Press to write a story with the lede “Sen. 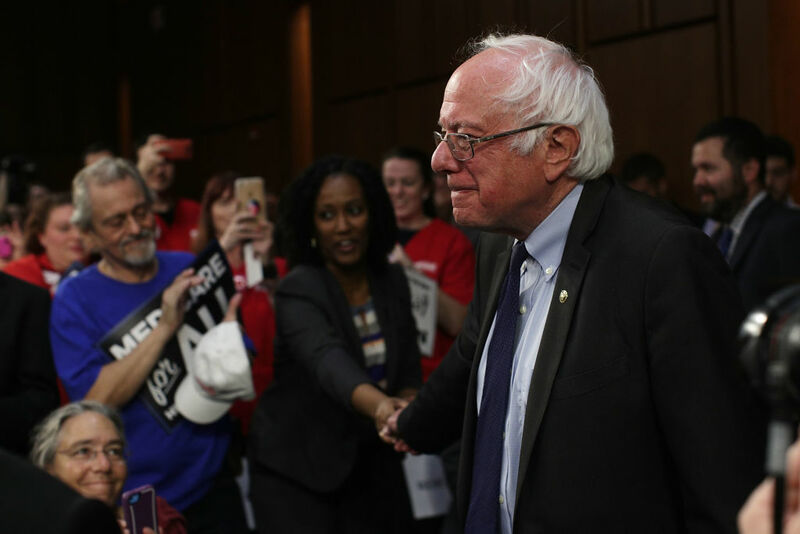 Bernie Sanders’ ‘Medicare for all’ plan would boost government health spending by $32.6 trillion over 10 years.” Because of the way the AP wire service works, that means the story showed up on just about every news website in the country: ABC News, Bloomberg, Washington Post, and so on. But this initial success slipped away from Mercatus because folks like myself quickly noticed that, buried in the report’s tables, the author had actually found that Sanders’s plan would save $2 trillion. That’s right: the same estimate with the scary $32.6 trillion figure they were promoting to all the journalists in the country also said that the US could insure 30 million more Americans, virtually eliminate out-of-pocket expenses, and cover dental, vision, and hearing care for everyone — all while spending $2 trillion less over the next ten years. After this was pointed out, the coverage of the report changed dramatically, and Bernie Sanders put out a video thanking the Koch brothers for their positive study. Needless to say, Mercatus was not thrilled that its attempt to torpedo Medicare for All had become one of the leading talking points in its favor, and so it badly wanted a do-over. The preferred theater for their do-over was gullible and biased fact-checkers who they successfully coached into declaring that Bernie Sanders is lying using their inane truth-o-meter and Pinocchio-based measures. To understand why the fact-checkers’ various declarations are themselves wrong or deceptive, it is necessary first to briefly slog through the actual Mercatus report to explain how it works and what its important findings really were. In the report, Charles Blahous initially starts with health expenditure projections produced by the Center for Medicare and Medicaid Services (CMS). Those projections say that, under our current system, Americans as a whole will spend $59.653 trillion on health care between 2022 and 2031. From there, Blahous adds the estimated cost of insuring the uninsured, virtually eliminating out-of-pocket expenses, and providing dental, vision, and hearing care to everyone. Then he subtracts the savings from lower administrative costs, lower drug prices, and lower payment rates for healthcare providers. After those additions and subtractions, the number drops to $57.599 trillion, which means there is a savings of $2.054 trillion. Blahous then proceeds to observe that, although Medicare for All saves $2 trillion overall, it also shifts nearly the entire healthcare bill to the federal government, meaning that federal expenditures will necessarily go up. Under the current system, the federal government is expected to contribute $21.927 trillion of the $59.653 trillion in total healthcare spending. Under M4A, the federal government takes on almost all of the spending currently done by private insurers and state Medicaid programs, meaning that federal expenditures go up to $54.571 trillion of the (now lower) $57.599 trillion of total health spending. Thus, total federal spending increases by $32.644 trillion ($54.571 – $21.927). There are two important things to note about this report for our purposes here. The first is that the claim “Medicare for All will cost $32.6 trillion” and the claim “Medicare for All will save $2 trillion” are two ways of describing the exact same estimate. The former claim refers to how much more Mercatus says the federal government will spend. The latter claim refers to how much less they say America as a whole will spend. If the $32.6 trillion cost figure Mercatus promoted to the entire world is correct, then the $2 trillion savings figure is also correct. In contrast with Thorpe’s and the [Urban Institute] team’s earlier estimates, the estimates in this study are based instead on the language of the M4A bill as subsequently introduced, imposing Medicare payment rates on all providers and thereby substantially reducing national average provider payment rates relative to current law. Blahous then goes on to say that if Bernie Sanders does not actually follow through with his plan as written and instead implements a different plan with significantly higher provider payment rates, then of course the cost will be higher. Blahous estimates these costs with “alternative scenarios” he constructs and then publishes in the appendix of the report. It is important to be very clear on this point, though: these alternative scenarios are not Sanders’s plan but are instead completely different plans Blahous constructed with higher provider payment rates. The Mercatus report created a huge mess that at first glance seemed impossible to fix. Mercatus really did release a report that said that Bernie Sanders’s plan, as written, saves $2 trillion in its first ten years. They really did promote that report and that specific estimate to the journalist community. So how then do they go back into the journalist community and get them to write pieces declaring that Bernie Sanders and Medicare-for-All advocates are lying about the content of the report? Apparently what you do is approach the various fact-checker journalists and try to sell them on the idea that the real estimate of Medicare for All is the alternative scenario Blahous constructed in the appendix of the report, an alternative scenario that Blahous himself says does not track Bernie Sanders’s plan. Think for a second about how completely absurd these three suspiciously identical fact-check pieces are. They acknowledge that Sanders and others are right that the Mercatus estimate says there will be $2 trillion in savings. But then they say Sanders is mostly lying because he does not also talk about alternative scores of totally different plans that are not his plan. It would be like if Sanders released a plan to raise the top tax rate to 70 percent and then a study came out that said the hike would raise $1 trillion of revenue but that a 60 percent hike would only raise $800 billion. Then Sanders said, “Good news, my 70 percent tax rate raises $1 trillion in revenue,” and the fact-checkers wrote pieces saying he was lying because he failed to mention that a 60 percent tax rate would raise much less. That is how ridiculous the argument of these pieces are. In addition to the absurdity of this general argument Mercatus coached these journalists to repeat, the specific fact-check pieces are quite funny and riddled with errors. The Washington Post piece, authored by Glenn Kessler, had three serious factual errors in it that he later had to correct. Although Kessler corrected these errors in his piece, one of the factual errors — that the Sanders plan would cut payments to medical providers by 40 percent — is still being broadcasted by the Post’s video version of Kessler’s story without correction. The Associated Press fact-check piece was authored by Ricardo Alonso-Zaldivar, who is the same AP journalist that initially reported on the Mercatus study when it was released in July. What’s funny about this is that Alonso-Zaldivar’s initial piece uses the $32.6 trillion estimate in both its headline and lede, but then his fact-check piece says that Bernie Sanders is basically being deceptive by using that estimate in his messaging. If the estimate is so deceptive, then perhaps Alonso-Zaldivar should take down his first piece reporting on it. As noted by Vox’s Dylan Scott, the really important takeaway of the Mercatus report is not whether Sanders’s plan saves precisely $2 trillion, but rather that the report confirms that the general Medicare-for-All idea is clearly doable. If you play around with the utilization rates, the provider rates, the coverage areas, and the actuarial value variables, you can generate estimates that range from modest savings to modest spending increases, meaning that a national health insurer that covers everyone in the country is clearly in reach, if we want it.